Laughter Yoga? Why not? Developed by Indian medical doctor and long time yoga practitioner Madan Kataria, this new form of stress relief has spread like wildfire. What started as a single class led by Dr Kataria eleven years ago, has now turned into more than 5,000 Laughter Yoga clubs and studios, spanning 50 countries, and growing daily. Rather than just another passing self-help fad, LY has gained the respect of institutions far and wide, and has been embraced by many medical professionals. These simple techniques combine deep yogic breathing exercises, with "laughter exercises." The wonderful thing about it -- that we all can recognize -- is that fake laughter, when done in a group setting, can easily turn into real laughter. And this is just what happens, without fail. The silliness of shaking your body, breathing deeply and laughing out loud with your face to the sky quickly moves many people to feeling embarrassed or ridiculous. But since everyone else is doing the same absurd thing, someone is going to laugh for real. And when they do, it's going to spread -- quickly. We all know that laughter is contagious. Soon the whole room is full of people doing the most natural and spontaneous of human behaviors -- cracking up. Tears flow, hearts open, hugs and pats on the back occur with ease. According to Dr Kataria, laughter has many health benefits, not just physically, but emotionally and spiritually. Laughter exercises the lungs, increases oxygenation, releases hormones and chemicals that benefit our overall health. Measurable results have been observed, including lowered blood pressure, decreased stress, strengthened immune system, and of course -- elimination of depression. Laughter Yoga is an extremely effective remedy for stress. And stress is said to cause, or contribute to 70% of all illnesses, including depression and anxiety, heart disease, insomnia, tension headaches, back pain, asthma and many others. Get Some Laughter Therapy Now! In the words of Dr Kataria: "Laughter helps bring forth the best in human nature. Laughing for no reason is born of right brain activity and therefore lacks reason and defies analysis. It is deliciously out of control because it is not a rational process. It is a purely physical process that does not need anything the mind has to offer (i.e. a reason, some sense of humor, or a belief of happiness). It brings forth the uncontrolled and unsubdued voice of the heart / the soul / your higher self that expresses and helps to manifest all of the intrinsic qualities of human nature. It is a state of mind-body in which the dominant emotions are pleasure, peace, love, and joy and as such it imparts a sense of well being and freshness." 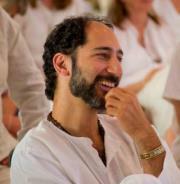 Learn more about Dr Kataria and Laughter Yoga at laughteryoga.org.